Last of the FAL projects round 2! 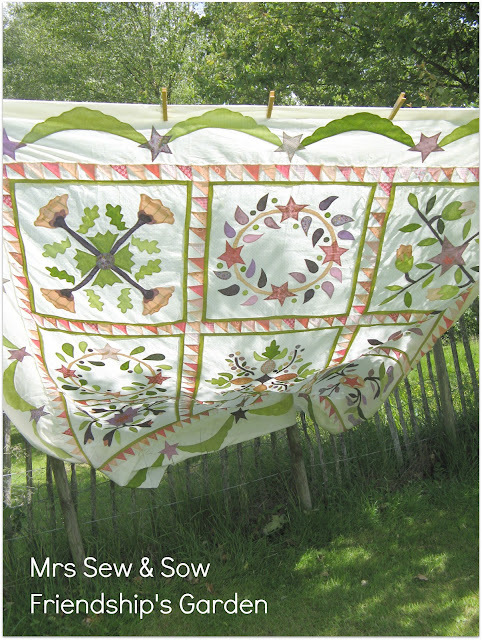 I stuck my hand up to complete 4 projects for this round of Rhonda's Finish-along! 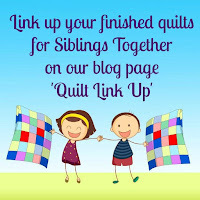 I have completed three but think one doesn't really count as it is only a finished top and not a finished quilt but that will be sorted out in the next round I hope! So I have less than a week and one project to finish! I have been putting this one off a bit ....shall I tell you why? 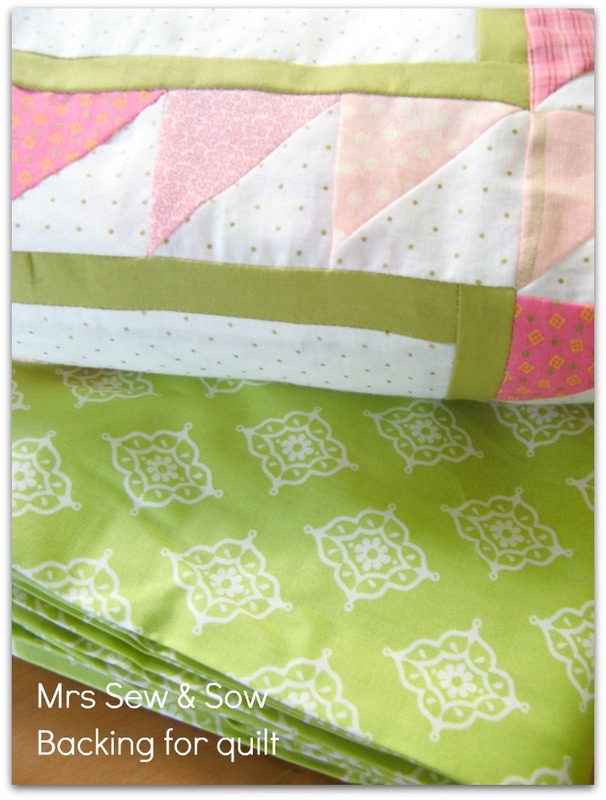 I love this quilt and really didn't want to spoil it with awful quilting! I am FMQing it - to death ! 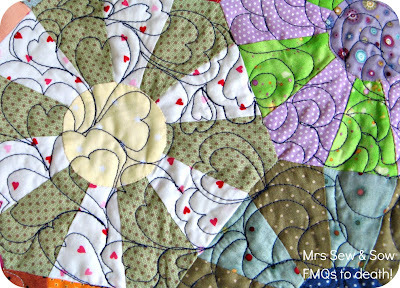 Or what some poeple might call custom quilting it...! But I don't like the look on these! 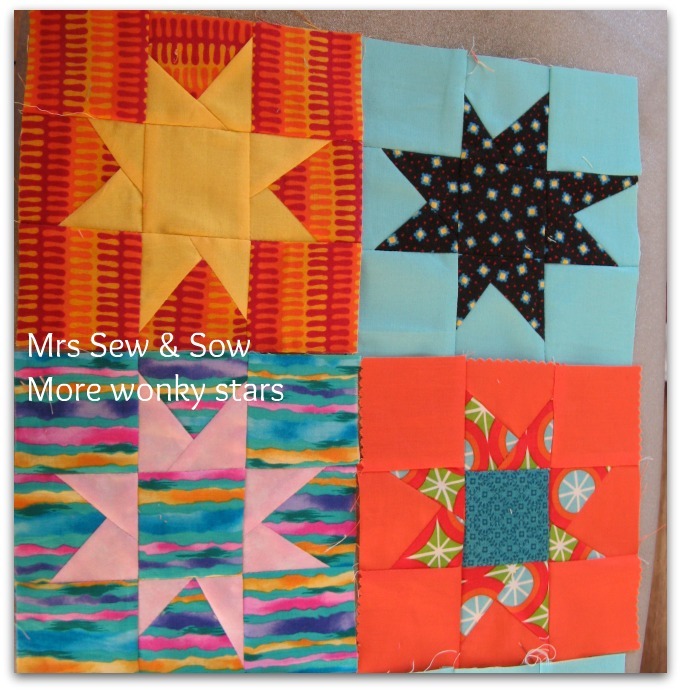 Which I am happy with ....pity I quilted seven hexies in the dark colour before I decided on the colour change! 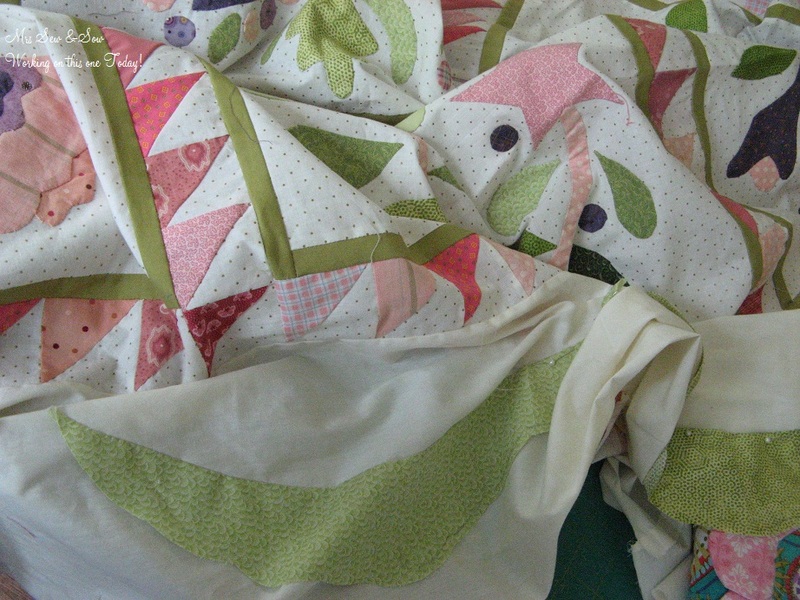 Oh well my unpicker and I will become good friends soon but not till I quilt the rest of it! 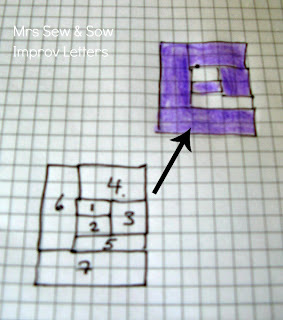 I had a bit of fun on Sunday making the third improv word block for my wall hanging. 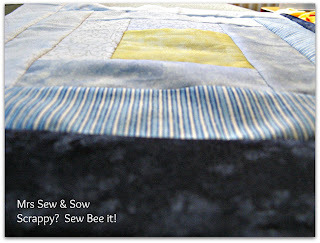 The others will I hope be supplied by my bee buddies from Sew & Bee Happy ! They are certainly signing up for the brave souls and some seem to be looking forward to the challenge...? This time I tried something a little bit different from the other two! Might be getting a bit wilder as I go along, throwing caution to the wind cos it's fun! 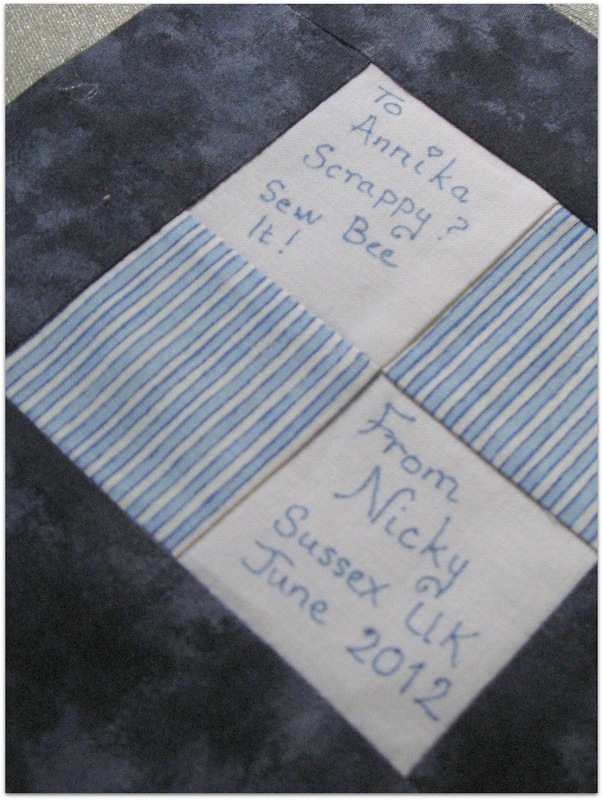 When I met Janine in Lewes recently I spotted the Lynette Anderson "Stitches" fabric which I have used as a tapered sashing on this block and went with the blue colours for the rest of the block! 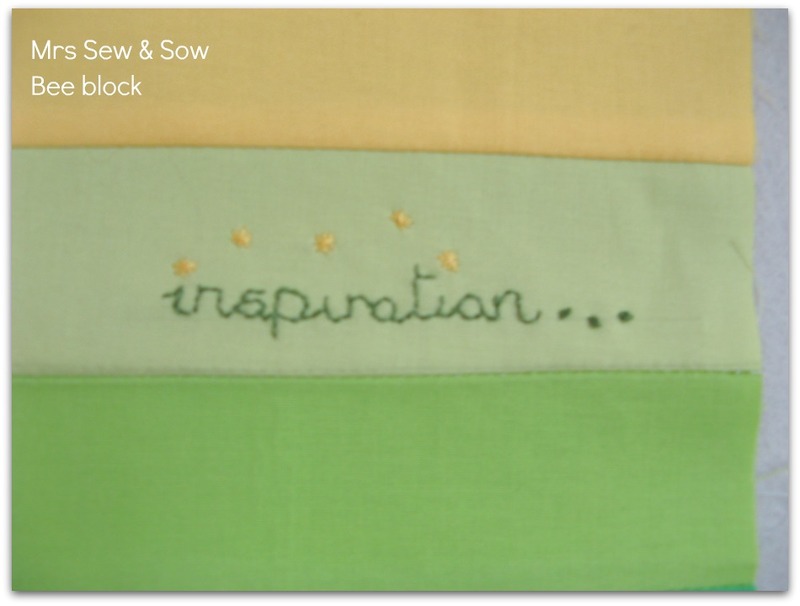 I love graphics and stitching so this word had to shout about itself a bit - though now I wish I had made it shout a bit more! 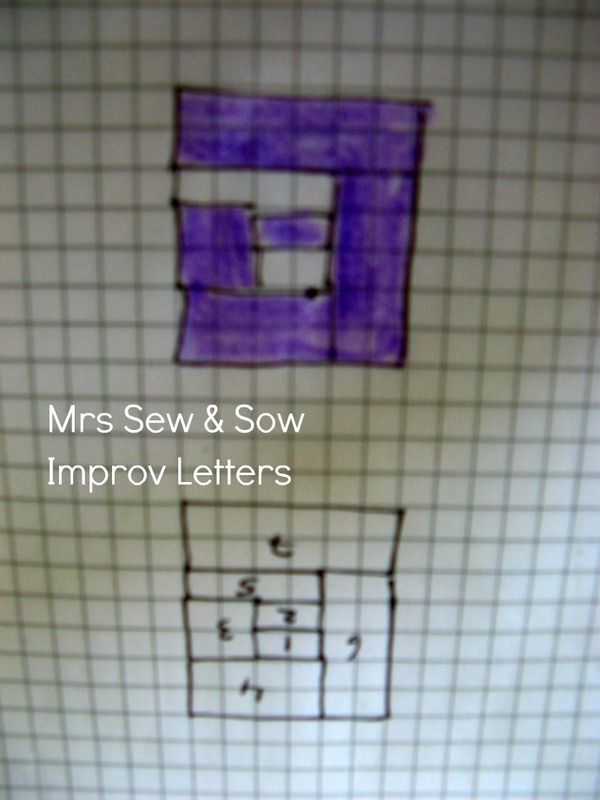 So if you fancy doing a bit of improv words believe me - they are not as tricky as they seem. If you go wrong you add a bit on or chop a bit off - my kind of piecing! I have posted links to my previous posts, which attempted to show you how, on the tutorials page and am happy to answer your questions if I can! 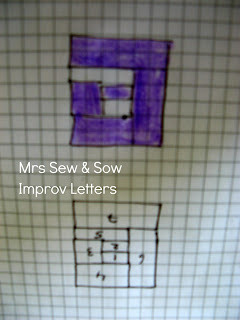 In fact improv means there is no wrong - I think! Joining in the fun with Fluffy Sheep! 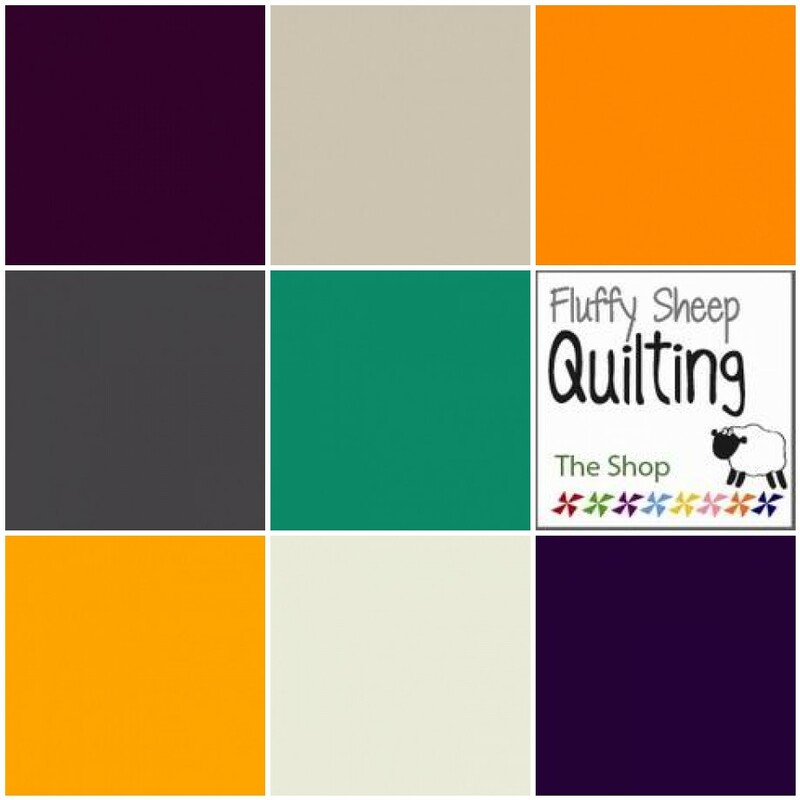 Cindy @ Fluffy Sheep Quilting is wanting us to create a Kona solids mosaic as she doesn't have any idea what fat eighths solids bundle we would like from her shop later this summer and lazy girl (hehe) she wants us to do the work for her! Never one to shy away from what I should be doing in order to help a friend I decided to have a go and came up with a neutral, orange and purple theme! Bit in your face but that must have been my mood this morning! The colours are: Dark Violet, Ash, Papaya, Coal, Jade Green, Corn Yellow, Bone and Purple! No excuse - she has some links to mosaic making tutorials - just remember to copy the names of your picks unlike me who had to go back and check them out! Catching up one bee block at a time! I am still a bit behind this month but one more bee block is done now and due to fly off to the other side of the world as part of Sew and Bee Happy. The block is simple - a graduation of colours and an embroidered word! I have dotted my letter 'i's with a yellow star or five to represent that sparkle that sets us all thinking! 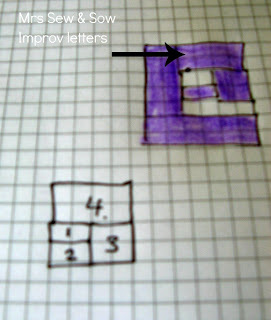 Yesterday I showed you how to make the letter 'e' and 'a'! 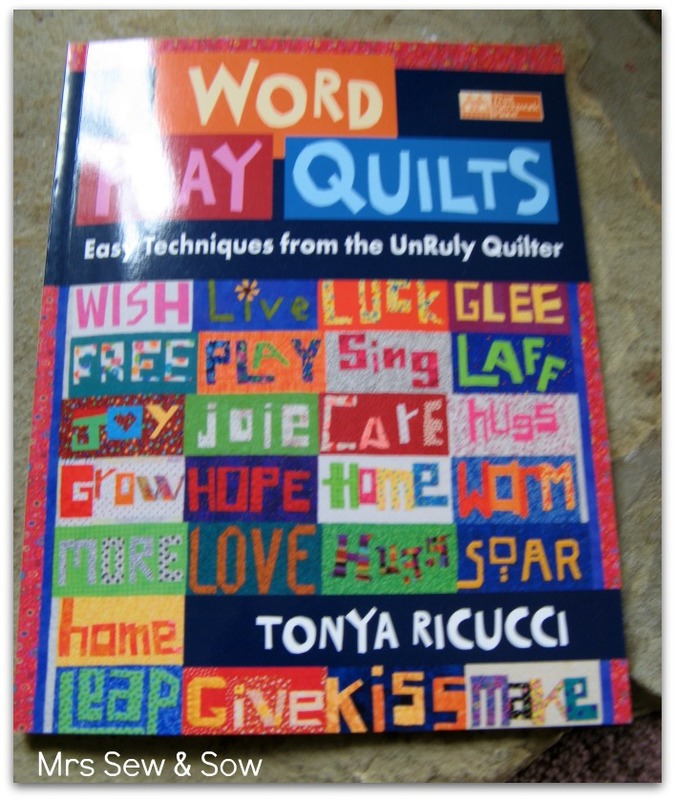 I have based my tutorials on Tonya Ricucci's book Word Play Quilts Easy Techniques from the UnRuly Quilter. 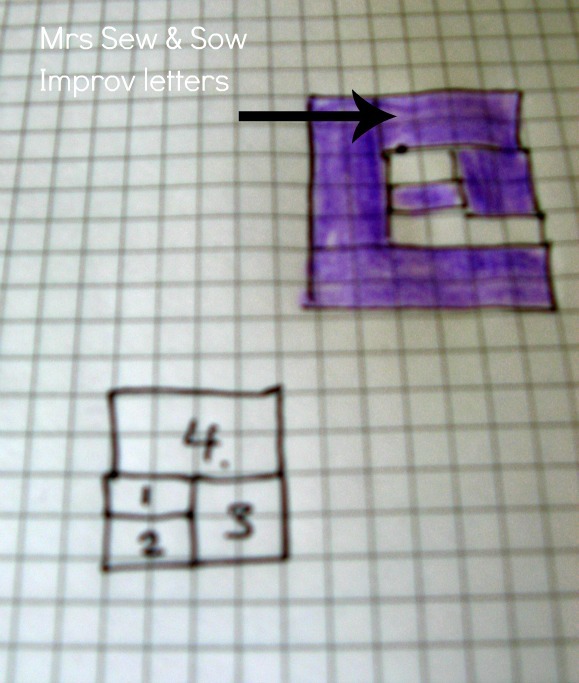 Today it is the turn of all those letters with a slanting line! 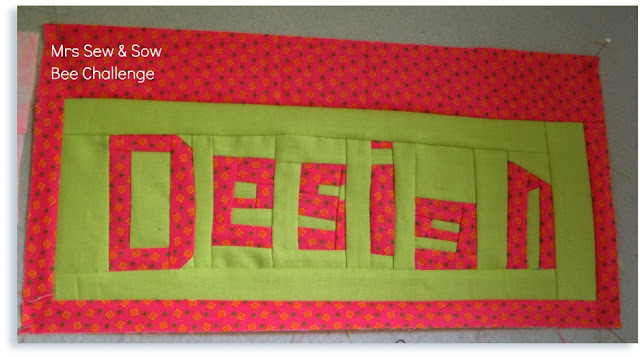 We need strips of fabric - one for the letters and one for the background. 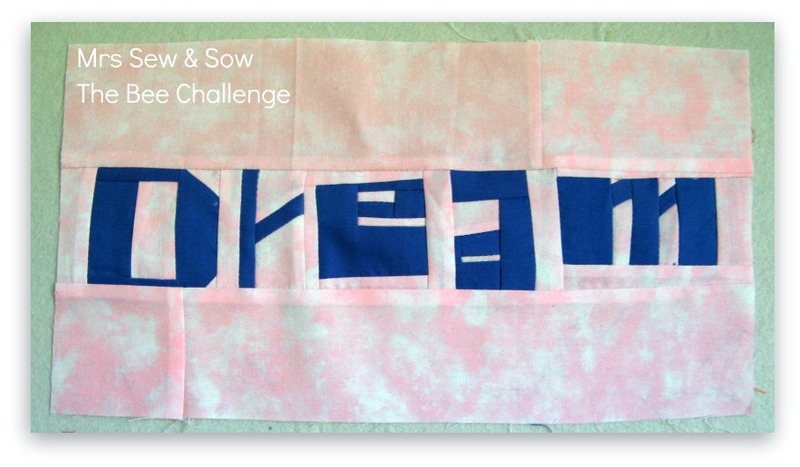 Again we start in the middle of our block - I started with a strip of background then sewed my letter fabric at an angle face down to the face of the background fabric. Next I cut along the raw edge of the seam and sewed the little bit of background I had just cut off back onto my letter fabric. 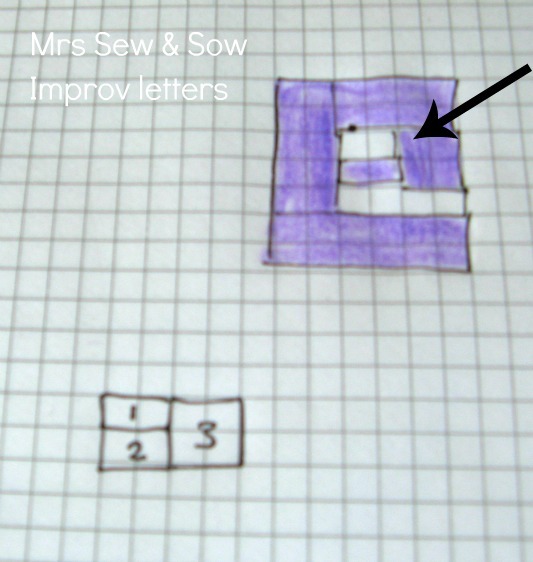 Then I attached a letter strip to each side of my stage 1 block and ended up with the letter 'n' or turn it upside down for the letter 'u'. Leave the end section off on the right hand side and you have the letter 'r'! Easy isn't it? Makes me think why I never did this before? Now you have the hang of it what words will you be making? 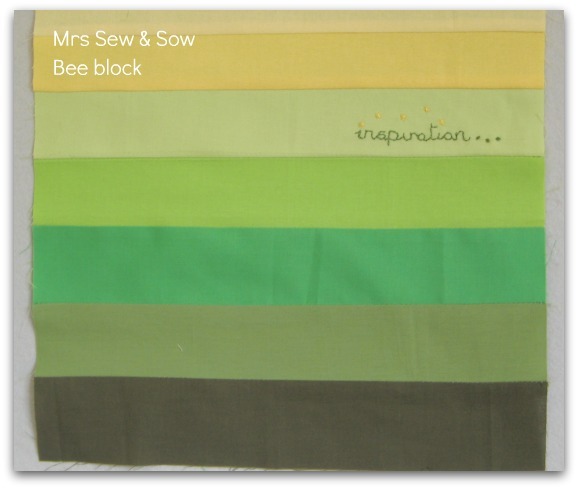 Further to my thoughts yesterday about being queen bee in the Sew Happy Bee in July I have now got a list of words I would like which I think describes the process of making a quilt for me! Stitch - will be done! 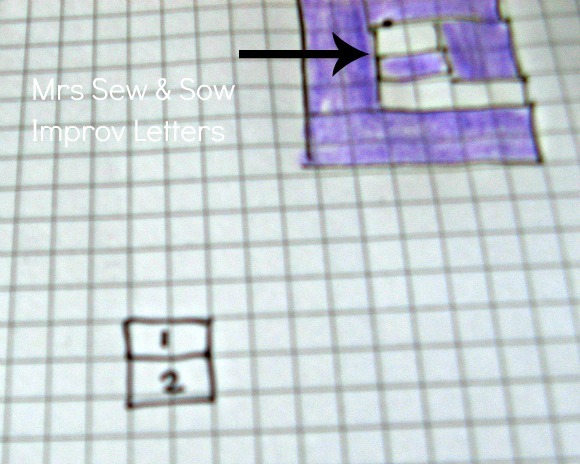 And plan to make the other 6 letter word Stitch! 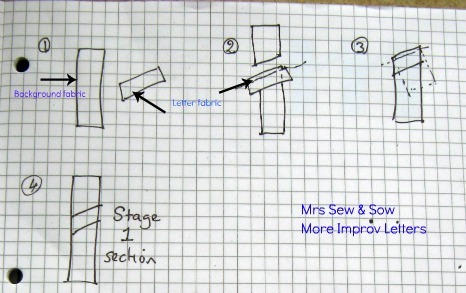 As you can see I want a solid fabric and a small patterned fabric. I don't mind whether the word is in the solid or not however it is important that there is a contrast between the fabrics so the word can easily be read! Busy prints will probably not work with this idea! I would also like the fabrics to be modern and the colours clear though I do not mind what the colours are - the walls in my sewing room are white! I am not bothered if the letters are chubby or skinny - in fact a mixture of letter height and width would improve the improv feel I think. So therefore there is no fixed size! To give you a sense of scale my blocks are 6.5" x 12" and 6.5" x 13". 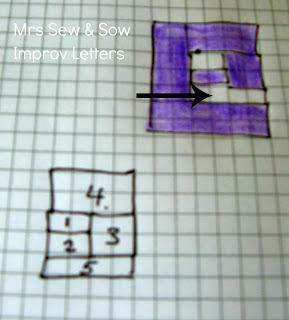 But skinny tall letters could make a block in the other proportion - 12" high x 6.5" wide! That would be fabulous! 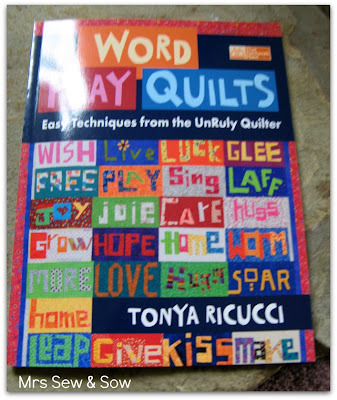 Now I was hoping to suggest my bee members use the excellent tutorials I found on Tonya Ricucci's blog but since she has brought out her book Word Play Quilts I guess she has removed them! The book is fabulous now that I have actually got around to using it! 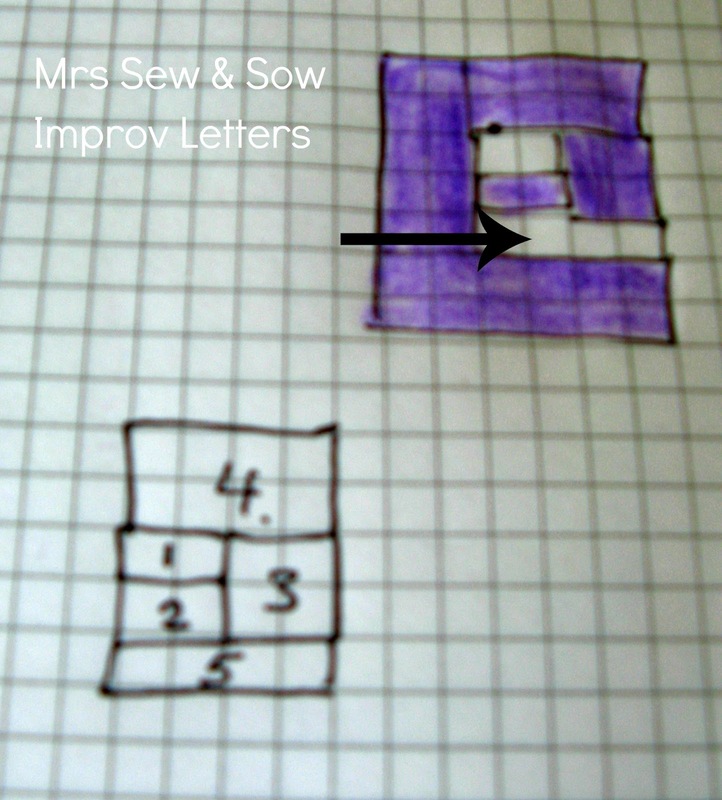 She starts with strips of fabric of different widths - for the letters and for the background. You do have to be careful with going too thin as you add other fabrics your chunky letters become thinner as the seams are sewn. I was almost anorexic with my 'a' in dream! 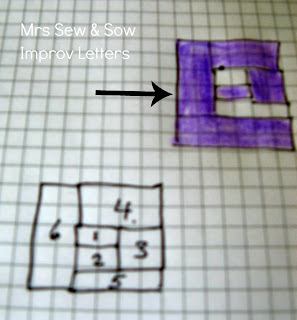 She generally starts from the middle of the letter and works out! An 'e' starts like a log cabin - a small rectangle of background joined to a strip of letter fabric. With just the circle we get the letters 'o' and 'c'. 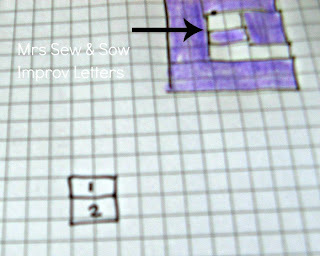 Tomorrow I will show you how to do letters with a slanting line - 'r', 'h', 'n' 'u', 'm' and 'w' - unless you work it out already! 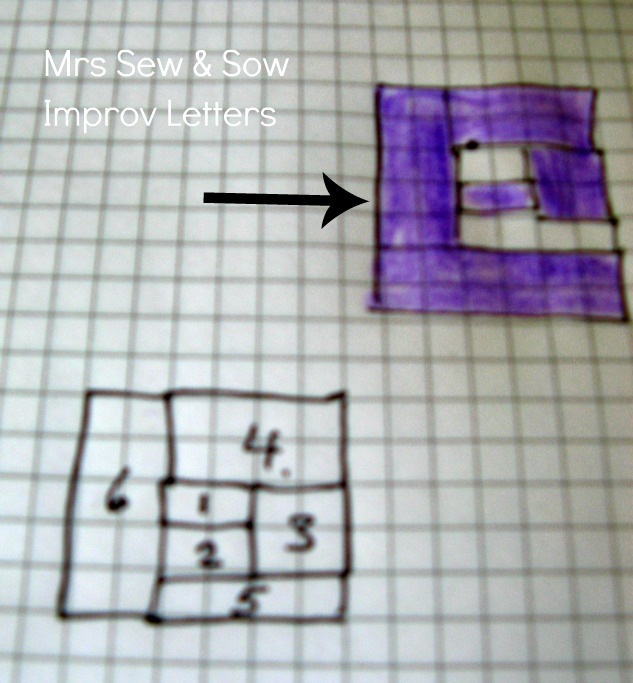 Another way to letters is the paper pieced way - thanks Jess for the tip off about this pattern Elizabeth Hartmann is bringing out on Thursday for all the letters of the alphabet as you can see here - called the Refridgerator Magnets Pattern - selling at $12.50 (about £7.95). Now I am not suggesting anyone needs to buy it but it gives you an alternative look to the letters of the alphabet - more regular than my liberated letters! 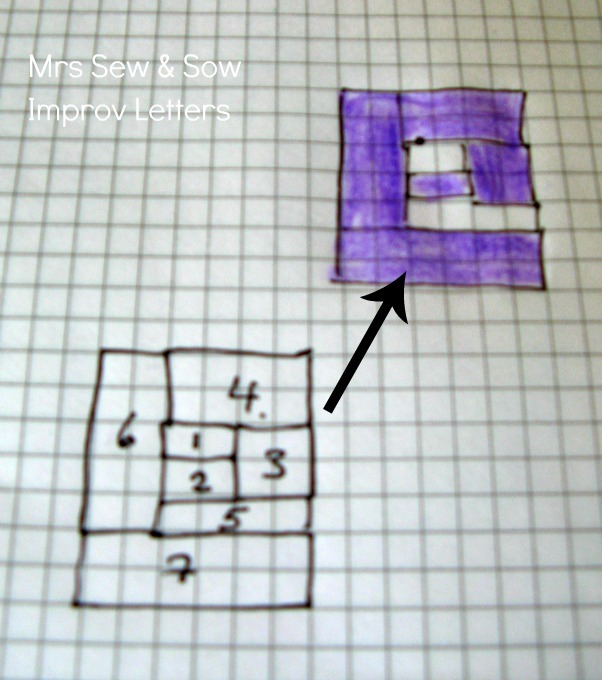 It would be easy enough to draw letters on graph paper and make your own. Just as I have done for the improv ones! 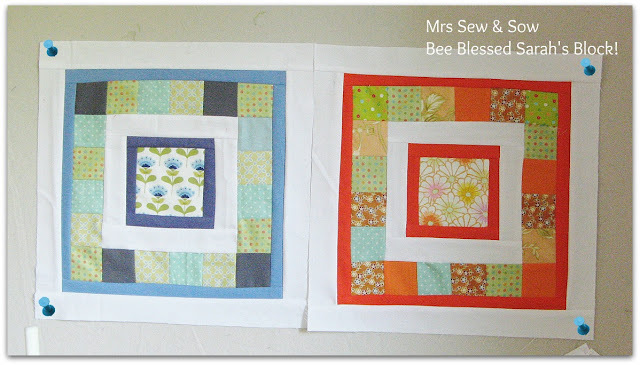 The truth of it is this - I want my bee members to make their own pattern and choose their own way of piecing as there is personality in the way we write and I would love to enjoy that too when I look at my wall hanging! The wonky world is coming to an end after making Wonky Houses, Wonky Trees, Wonky 4-Patches and Wonky Stars as our lovely mama Jane moves onto other things! 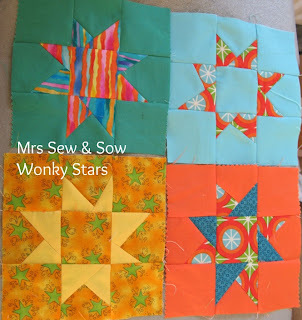 This time I was ambitious and put myself down for 20 wonky four-patches and eight wonky stars! Bit of a rush at the end but these have to be posted soon to arrive in the US by the 1st of July! I have a couple more bee blocks to make before I can rest on my laurels - it seems that I have joined up with quite a few bees now .....not quite sure how that happened!? I think I am all bee-ed up ! 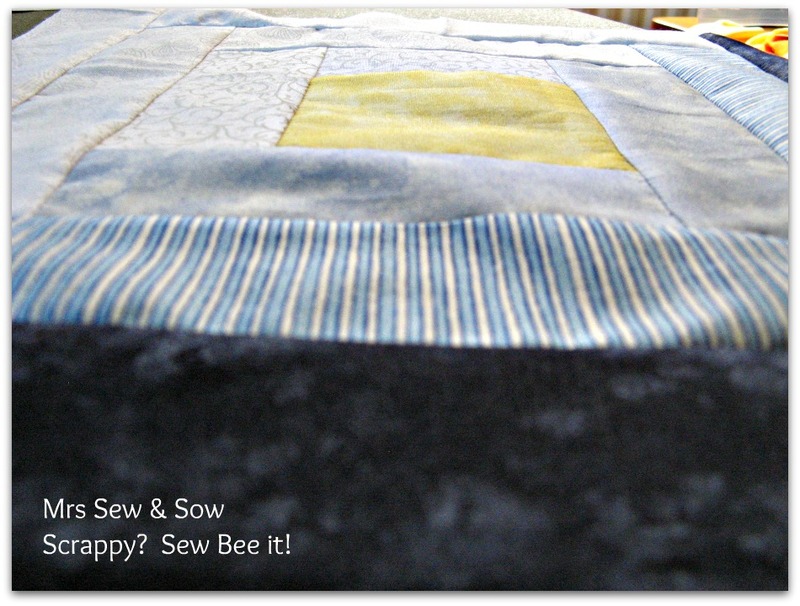 But next month I am queen bee in Sew & Bee Happy so must get my thinking cap on ! 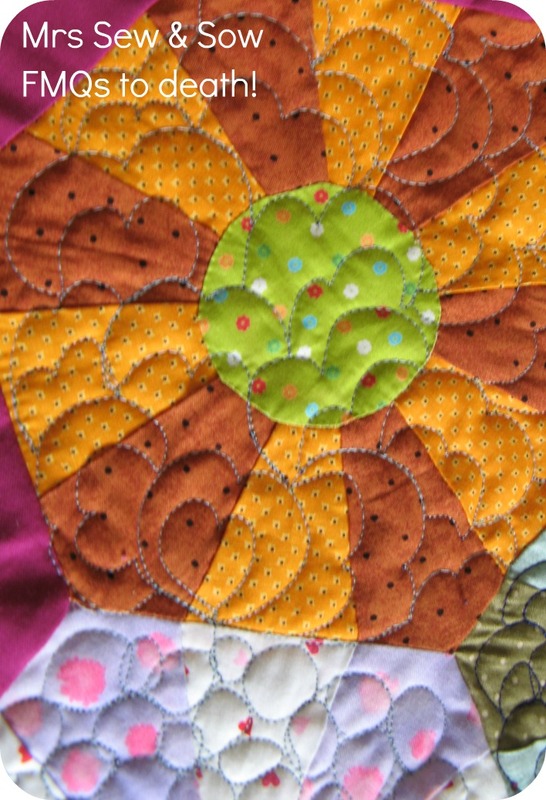 I was thinking of asking for stitching words to do with sewing and patchwork - eg Stitch, Quilt, Sew, Bind, Embroider - either improv style, applique, porthole style, embroidered, or any other technique but am wondering what they will think about that? 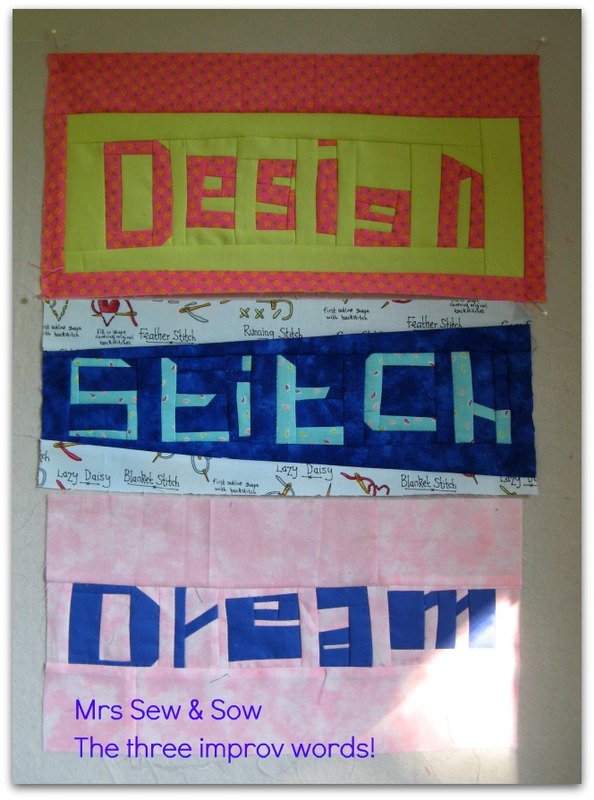 I fancy an inspirational hanging in my sewing room made from the words and a reminder of friends made through the internet! 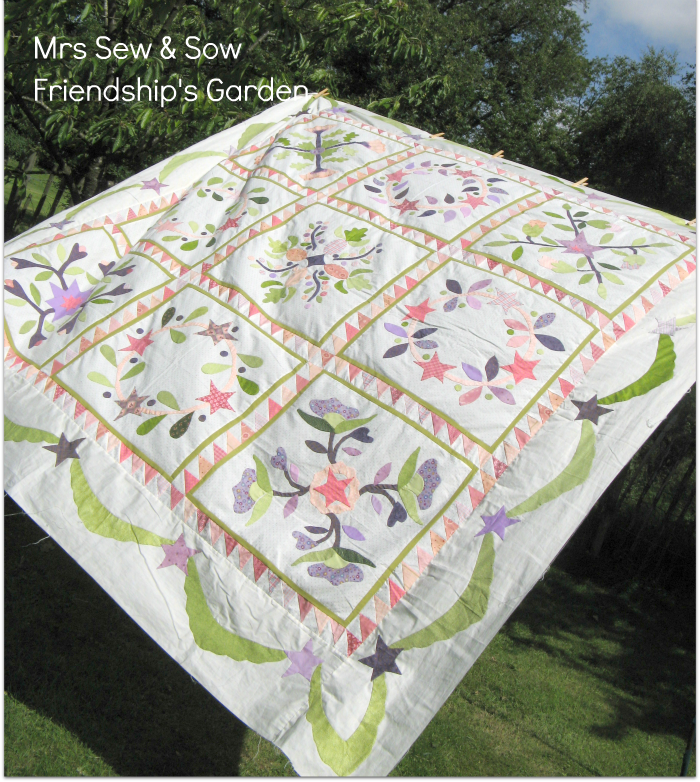 Started in 2005 at a 'learn how to applique course' at the Quilt Shop in Dorking with Julia Illman, this poor quilt has lain unfinished for years. 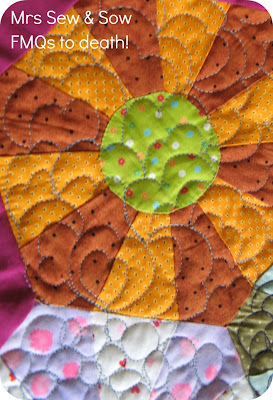 To begin with I only did handstitching and only applique - the blocks are all handstitched needle-turn applique. At the time it was the HST borders that put me off finishing! I got them completed last year. I you look closely some HSTs are missing a few points - those are the ones I made in 2005. 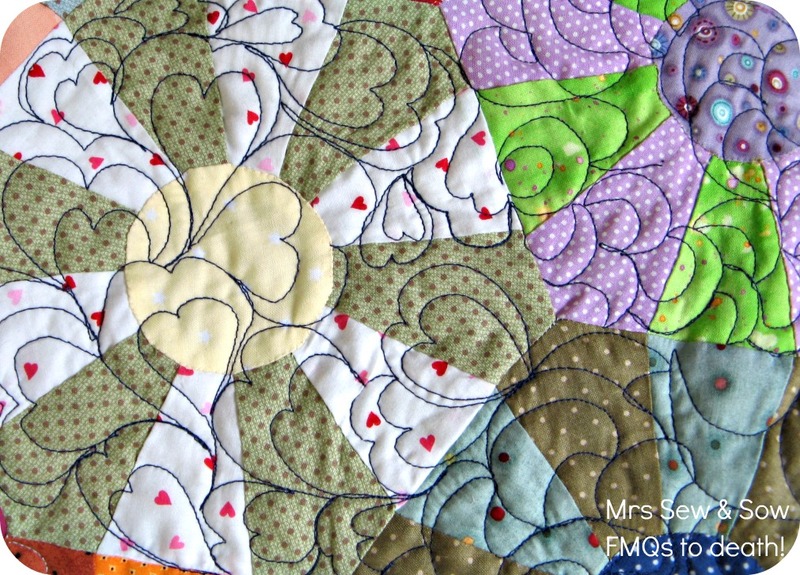 The ones I did more recently look a lot better - I could have changed them all but I wanted this quilt to have a story - my story - so I left them in! Then as I haven't done much recent applique it was the borders that stalled me last year - but I did manage two! Now they are all done and to be honest it didn't take that long! 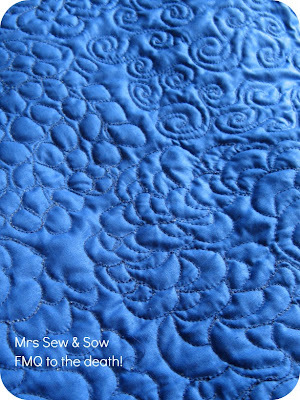 Just the quilting to do and I'm hoping to finish this quilt in September - in time for our Silver Wedding Anniversary! It may have taken 7 years to complete but it will represent 25! Another Finish-along project done! 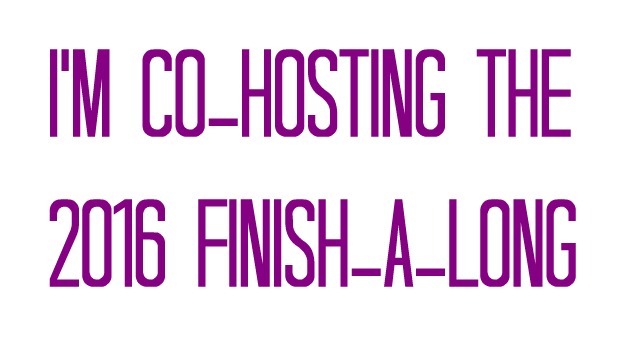 Just one more to do by the end of June! ...since I last wrote a post! I have not disappeared I have just been elsewhere! I got the sudden urge to host a framed purse swap inspired by the brilliant Katy Jones who taught us how to make one while at the Fat Quarterly Retreat! And nudged into it by the lovely Helen. We thought we'd limit it to 30 swappers but seem to have collected 39! It's true I can't count to 30! Well we have just sent out partner allocations after a bit of head scratching to find the best fit among a fabulous bunch of swappers! I am so pleased by the lovely people who have showed up and joined in! I just hope you have fun stalking your partner for information and find what you need to inspire you for the fantastic purses I know you will be making! These will go in the post on Tuesday - my posting day! Lots more still to do! And my FAL list! Think that one might need some better photos if the weather will co-operate! 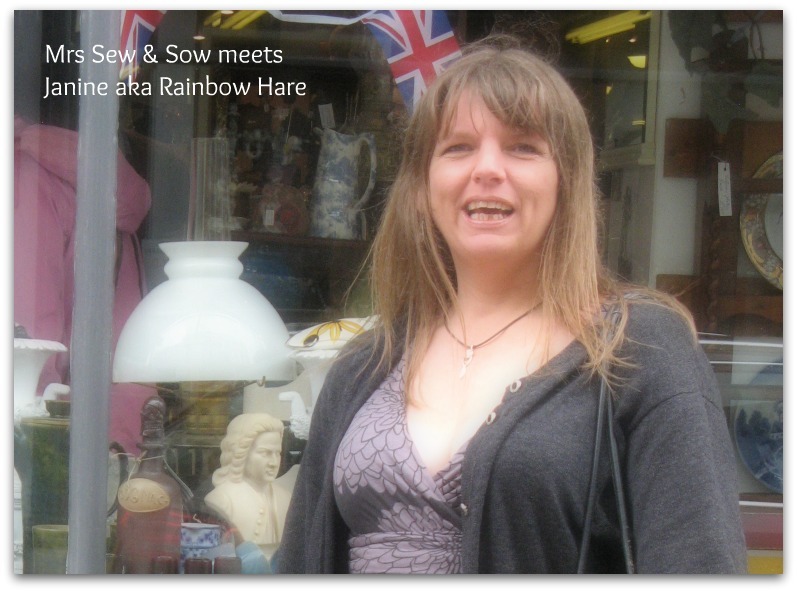 And even found time to meet Janine aka Rainbow Hare! We were chatting a lot while browsing the shops in Lewes! We plan to meet up again! Thanks Janine for coming along and for the very kind gift of her own hens eggs! They got home safely! This is what I was working on today....a bit of handstitching. This is my oldest UFO which I got out of the cupboard. It dates back to 2005! 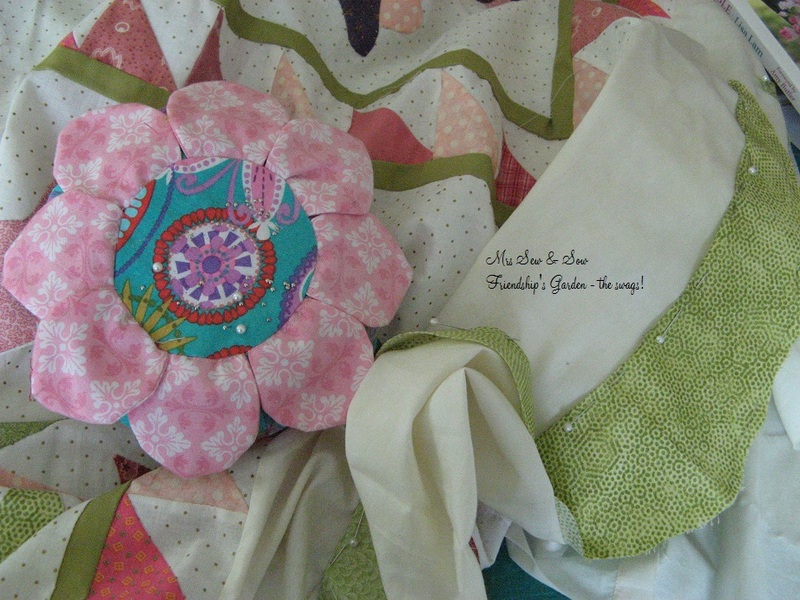 Can you believe it - I only did applique back then and all handstitched!?? There are a lot of little stitches in the quilt - it doesn't bear thinking about ...but it is probably one of the reasons I manage to handstitch quite quickly! 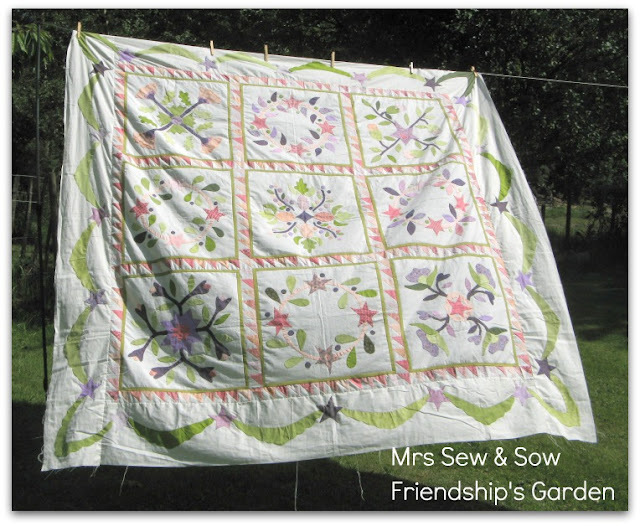 It is a design called Friendship's Garden by Alma Allen and Cherie Ralston! I still love it but just have the borders to finish off my quilt top! I did two in autumn last year and am supposed to finish the other two for the end of this month.... for Rhonda's Finish-along - the second quarter mark is looming. I made good progress today - all the swags are attached along the smooth top edge - just have the lower scalloped edges to do - then a few stars and bingo job done! 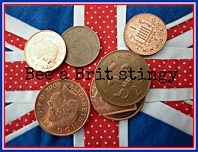 I was doing this and checking up on how everyone is getting along with all the hoops and obstacles Helen and I set you before we can get started making purses! 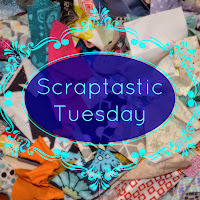 I am hoping we can be looking at sorting partners soon - but we do need those sign up forms and your mosaics! 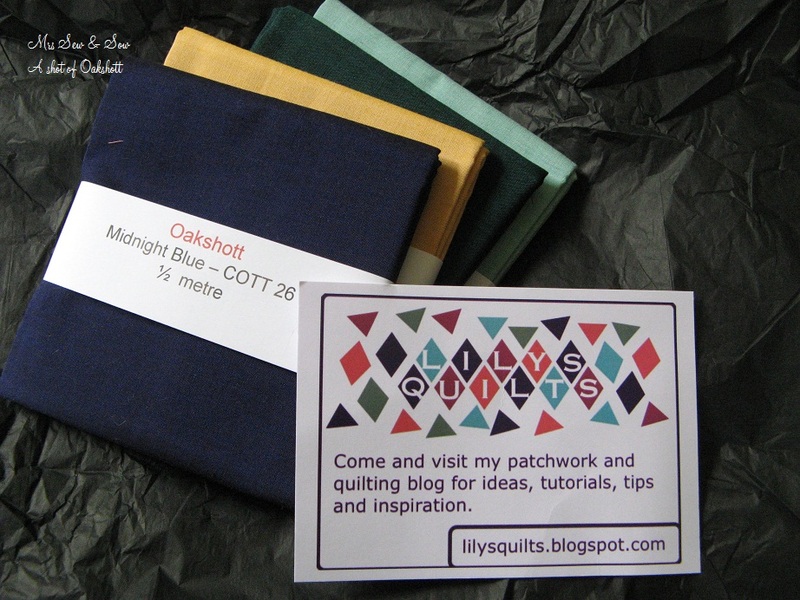 Now I was sad that although the owners of Oakshott visited FQR last weekend they didn't bring any fabrics! I had a list I wanted but nothing doing ! I had even taken my £5 off vouchers with me - Helen I was a little bit organised! So what else could I do but place an order on-line? I mean I'd already bought them in my head! I hope to team them up with some Liberty for some more porthole making! And what's that nestled amongst them? Lynne Goldsworthy? I swear that girl gets everywhere! Doesn't she know I'm all over her blogspot already ? Positively stalking her! Nice to be reminded though! In the Frame Purse Swap up and running! Look what Leanne made me! Umbrella Prints Competition - voting begins!